Apple is a phenomenal company. Its market capital nearly doubles its next closest rival, Google, and it profits are the third greatest of any company in the world, according to Forbes. Its so-called “war chest” – the money it has in liquid assets – is now over $200 billion. Even the largest banks and petroleum companies struggle to keep up. That’s enabled the company’s famous reliance on proprietary technology. While other companies outsource, Apple keeps it in-house whenever possible. Recently, that’s expanded to include the chips found in iOS devices. While Samsung, Microsoft, and HTC rely on Qualcomm and Intel, Apple hired its own team of engineers to work on proprietary designs exclusive to the iPhone and iPad. At first, the fruits of this labor were modest, but with each new release Apple’s AX chip line has become more threatening. Cupertino’s engineers have already put other ARM chip architects on notice, and they’re nipping at the heels of Intel’s finest. In April of 2008, Apple purchased a small fabless semiconductor company called P.A. Semi for a rumored $278 million in cash. The company was founded five years earlier by Daniel Dobberpuhl, a veteran engineer who first joined DEC all the way back in 1976. He worked on the company’s highly successful MicroVAX in the 80s. In 1998 he founded SiByte, which built MIPS system-on-a-chip hardware. That company was bought by Broadcom several years later. P.A. Semi’s processor would’ve been an excellent choice for the MacBook. P.A. Semi’s focus was the design of a chip called PWRficient. As its name suggests, it was built on the basis of IBM’s Power architecture, which Apple used in its computers until 2005. The idea was to build a new chip from the ground up with performance-per-watt as a key design goal, while at the same time targeting high performance applications. 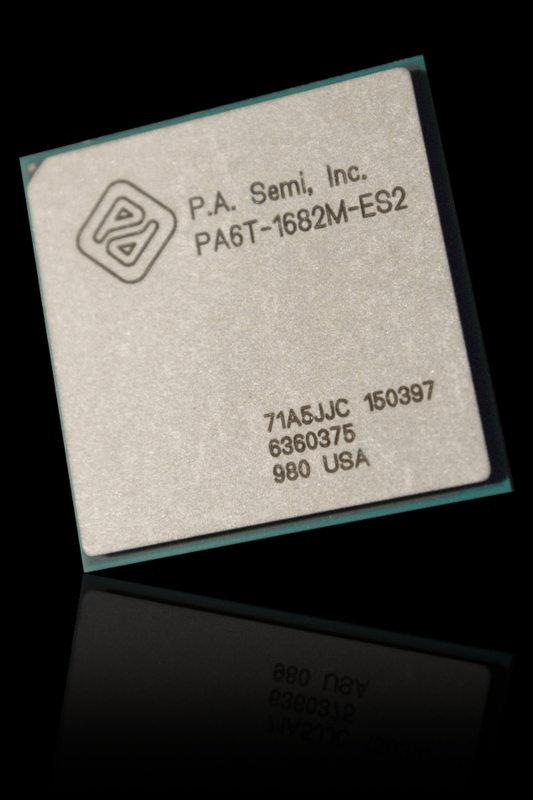 Its first chip, named the PA6T-1682M, ran at 2GHz but consumed only 13 watts in “typical” usage. A similar Intel chip from the era needed around 20 to 25 watts. Despite the focus on efficiency, PWRficient was not for mobile devices. The category didn’t really exist in volume, after all, and the consumption of the first chip was too high for small devices. The focus, instead, was – well, it’s hard to say. Like any start-up, P.A. Semi was forced to take an “if you build it, they will come” approach. While the hardware could be useful in anything from supercomputers to laptops, the company had no immediate design plans. In fact, the PA6T could’ve been an excellent choice for Macs, and OS X laptops in particular. Its combination of performance and efficiency in a power envelope well below 20 watts could’ve given Intel’s hardware a run for its money. As reported by The Register in 2006, Apple and P.A. Semi “formed a tight relationship,” to the point that the start-up was “counting on the deal.” Instead, Apple chose Intel, and P.A. Semi was forced to court manufacturers of high-end specialty hardware like Mercury Computer Systems. Obviously, Apple didn’t forget about P.A. Semi, as it rounded back to purchase the company as the foundation for its in-house engineering initiative. Industry analysts weren’t sure how much to read into Apple’s acquisition. A chip design firm can be used in many ways. Apple already had plenty of ARM hardware to choose from, and Intel was ramping up Atom, which was meant to compete in phones as well as budget PCs. Many commenters concluded that P.A. Semi would be used to accelerate specific tasks through specialized chipsets and controllers, or that Apple planned to use the company’s talent to help cement the implementation of hardware acquired from its partners. While the P.A. Semi deal gave Apple over 150 talented employees to throw at the problem of designing its own processor, the deal apparently was not without issues. After two years of near silence about the start-up’s integration into the Cupertino behemoth, news broke in March of 2010 that Dan Dobberpuhl had left the company sometime in late 2009. Apple’s quiet purchase of Intrinisty was only noticed when staff changed their employer on LinkedIn. He wasn’t the only one unhappy with how the acquisition turned out, as a number of key engineers decided to jump ship in the years after Apple took over. Off-the-record sources told The New York Times that some P.A. Semi employees were unhappy with the stock grants provided after the purchase. Other analysts speculated that the engineers simply weren’t happy in the new, more rigid corporate structure. Whatever the case, Dobberpuhl and other engineers banded together to form Agnilux, which was independent for less than a year before being purchased by Google. Dobberpuhl himself did not stay on at Google, but several team members who remained now work on Chrome OS. Its mission incomplete, Apple sought out another source of talent that might immediately improve the company’s mobile hardware. The new target soon became Intrinsity, a chip-design company based in Austin, Texas, that was founded in the 90s under the name Exponential Technology. As with P.A. Semi, Apple and Intrinisty had history. In the mid-90s, when it was known as Exponential, the company partnered with Apple to build a new processor to help Mac systems keep up with Intel. But Cupertino had become a revolving door, and the Mac was losing money. 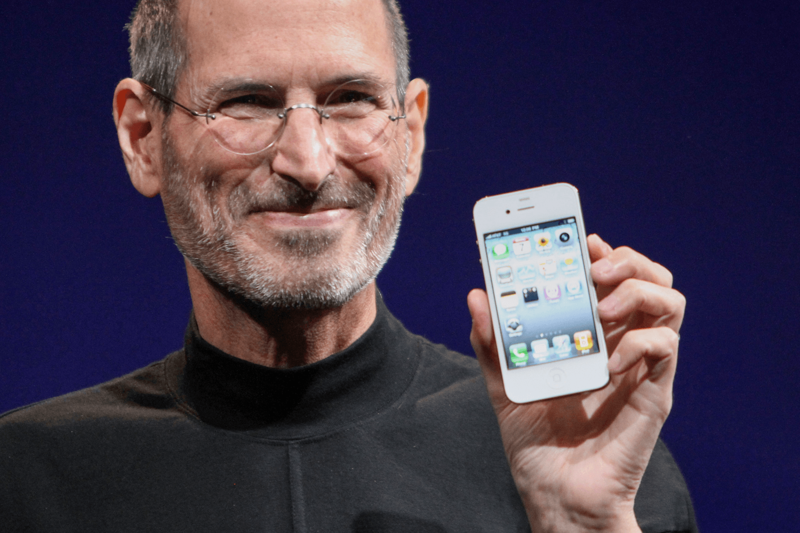 The return of Steve Jobs put the final nail in the deal’s coffin. He quickly brought the traditional IBM-produced PowerPC designs back into favor. Defeated, Exponential re-branded as EVSX, Inc, then as Intrinisty. It worked with chips using the MIPS instruction set and largely flew under the radar of the technology press, but in 2009 it made headlines by partnering with Samsung to develop the 1GHz “Hummingbird” mobile processor. The chip was an important milestone for everyone involved, as it departed significantly from the off-the-shelf Cortex A8 designed and distributed by ARM. Intrinisty’s role was the implementation of a unique design process that made it possible for the Cortex A8, normally clocked at 650MHz, to instead hit 1GHz, as it did in the first Hummingbird chip. That was a huge leap forward at the time. Most companies building mobile hardware simply relied on ARM’s design, with perhaps a tweak here or there. Hummingbird was entirely compatible with A8 and the ARM instruction set, but its design was re-worked from the ground up, which resulted in far superior performance. Only Qualcomm’s Snapdragon was in the same league. Early Samsung phones likely wouldn’t have achieved a strong foothold throughout 2010 if Intrinisty hadn’t helped squeeze every last drop of performance out of its devices. Cupertino took note, and swooped in — and Apple didn’t trumpet its purchase. The media took notice only when Intrinisty employees started to change the employer they listed on LinkedIn. In that sense the move was a surprise, but unlike the purchase of P.A. Semi, the reason for acquiring Intrinisty was obvious: The A4 processor, which powered the iPhone 4 and iPad, appeared at the same time as the acquisition. Like Hummingbird, it was based off ARM’s Cortex A8 but was able to hit speeds of up to 1GHz. The dots aren’t hard to connect. The newly acquired talent was quickly put to use. While the A4’s immediate successor used a design based off ARM’s Cortex A9, the A6, released in 2012’s iPhone 5, became the company’s first fully custom design. Internally called Swift, the A6 continued to use the ARM instruction set but otherwise abandoned the off-the-shelf design made available by the company. A teardown by Chipworks found that unlike most competitors, which sketch the general layout of a processor with software, the A6 was manually designed. Though labor intensive and costly, a manual approach typically results in greater efficiency. Software is useful, but it’s not creative. Only a team of engineers can find inefficiencies and imagine unique solutions. In web benchmarks, Apple’s A9 nearly matches Intel-powered mobile PCs like the Microsoft Surface Pro 3. Reviews of the iPhone 5 made it quickly and immediately clear that the efforts of Apple’s new engineers had paid off. The phone achieved a greater performance leap over its predecessor than any prior iPhone, more than doubling the speed of the iPhone 4S in many benchmarks. The iPhone 5 was so quick, in fact, that it still compared favorably to many mainstream Android handsets introduced in 2014, most of which used processors derived from the standard ARM Cortex A15 design. Apple’s performance lead has only increased since then. Its newest chip, the A9 (which powers the iPhone 6S and 6S Plus), annihilates the competition in most benchmarks, and often more than doubles the score of its closest rivals. In web benchmarks like Kraken and SunSpider, it nearly matches Intel-powered mobile PCs such as the Microsoft Surface Pro 3. GeekBench tests have also placed the iPhone 6S within stone’s throw of the Intel-powered MacBook. 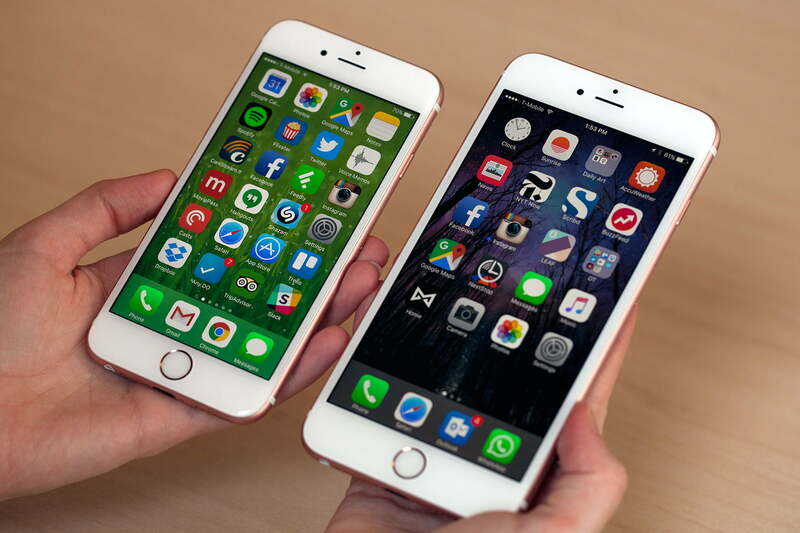 That’s not to say the iPhone 6S is about to overcome Intel’s finest, or that Apple now has the edge. The situation is more complex than that. Comparing a device that runs iOS to one that runs Windows is difficult not only because of the difference in operating system, but also because PCs run programs with more demanding memory and processing requirements. Still, a few minutes alone with an iPhone 6S, or even the iPad Air 2, can tell you there’s something to Apple’s rapidly rising scores. The company’s mobile devices are blisteringly quick. They rarely hesitate, handle multiple apps with ease, and play games at least as well as a PC with Intel’s integrated graphics. And they do all of that within a power envelope that puts the most miserly Core M to shame. I reached out to Patrick Moorhead, founder of Moor Insights & Strategy, to gain perspective on Apple’s success. His reply was crisp. “It’s really unprecedented in the industry that a team like this should crank out such high-quality silicon. Typically, those who crank out silicon for their own products aren’t industry-leading,” he said. Indeed, there’s no recent example of any company achieving the same. Chip design is not Apple’s core business, yet it’s managed to defeat companies like Qualcomm that exist for no other reason. The strategy of designing hardware in-house for first-party products, known as “vertical integration,” used to be considered a sure-fire way to fail. Cupertino’s engineers are changing the notion of what’s possible. Chip design hasn’t been without its troubles, however. The scope of an Apple product launch makes manufacturing enough silicon difficult. While it has made major progress in performance, the company is still different from Intel or Samsung in one important way. It doesn’t own its fabrication facilities. These days, most processor design companies don’t. AMD, Nvidia, and Qualcomm are just a few of the major names that rely on a third party to build what they engineer. None of them sell on the scale of Apple, however, and that’s led to production constraints. The iPhone 6S exemplifies this, as it contains one of two similar chips built by different foundries. 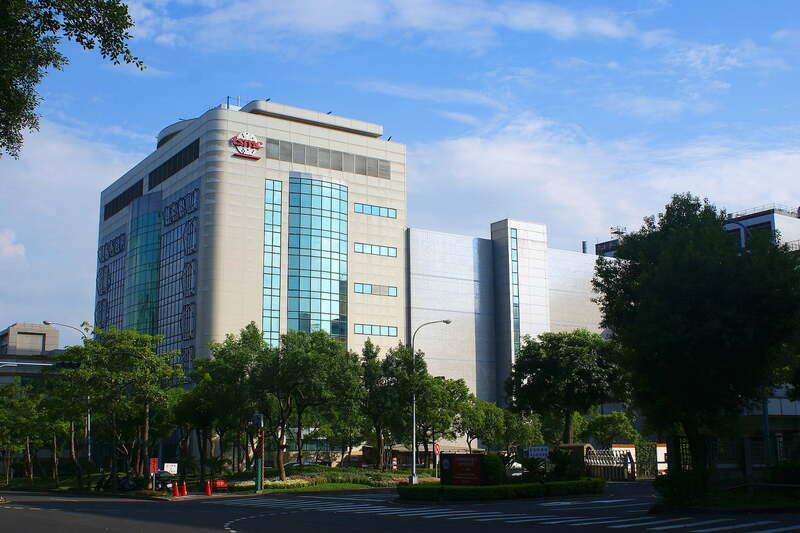 One is TSMC, which uses a 16-nanometer production process. The other is Samsung, which builds the A9 with its 14nm process. This, like so much of Apple’s endeavor in chip design, is extremely unusual. Using two different foundries obviously complicates making a device perform predictably. The difference is too small to notice outside of a controlled benchmark, but it’s obviously not ideal. Some have called the issue “chipgate” – though, so far, it doesn’t seem to be gaining traction like the iPhone 6’s bending issue or the iPhone 4’s antenna. Design costs are also an issue, as an architecture can’t be ported from one production process to the next just by tweaking a few parameters. It’s a difficult problem that requires a unique approach for each foundry. While the overall design is the same for both Samsung’s and TSMC’s chips, the products are not the same size and have differences visible in a die shot. That means Apple had to double up on some of its design work. There’s no easy solution to this problem. Even buying or building a chip fabrication company in-house might not work. Apple had to contract with two of the world’s largest to obtain enough volume, so it would take years to build up similar capacity internally even if the company purchased one of the world’s leading producers tomorrow. Production will hold back design for years to come. The next chip scheduled for delivery from Apple is the A9X, which will appear in the iPad Pro this November. While still shrouded in detail (no one knows its clock speed, or how many cores it will have), it’s alleged to out-perform 80 percent of portable PCs shipped in the last 12 months. Which, let’s face it, is another way of saying it out-performs a respectable chunk of Intel powered hardware sold today. I know, that sounds ridiculous. But the idea that Apple might build its own class-leading mobile silicon seemed equally ridiculous just a few years ago. The chip design wing in Cupertino may be young, but it has serious talent — and access to the company’s Scrooge McDuck vault. Patrick Moorhead is certainly optimistic about Apple’s prospects, saying “I think with their momentum, Apple will continue this for a long, long time in mobility,” and adding “what they’re trying to do right now is move up the processor food chain to a desktop-sized processor.” If the A9X delivers what it promises, it could seriously upset the balance of power in silicon, and between Apple and Intel in particular. While the A9 and A9X are huge wins for Cupertino, they’re important to far more than the company’s bottom line. Producing best-in-class chips from nothing in a span of five years is a feat everyone thought impossible – so no one tried. As iPhones and iPads extend their performance lead, others with deep pockets will begin to wonder if they, too, can design their own silicon.